You can't go to the Oktoberfest in Munich? No worries; we'll bring Oktoberfest over here to you - we're delighted to invite you to one of the best Oktoberfest in Belgium, if not in Brussels! And who does it better than the Bavarian, where it all started? Therefore, we’ve decided to stick to the German roots and have a massive Oktoberfest celebration at the prestigious Steigenberger Wiltcher’s Hotel! 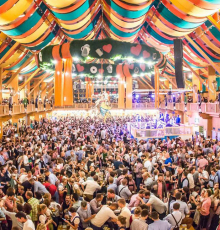 Spread the word among your friends, put on your Dirndl dress / Lederhose, or just be your self, and come along to live a great themed experience and indulge your palate with mouthwatering Bavarian beer and food and enjoy an Oktoberfest live band.